Tova Saul moved to Israel from Pittsburgh in 1981 to find the man of her dreams. That quest is still pending. Along the way, however, she found a niche as a tour guide, and also as an animal advocate and rescuer. Now she is combining her vocation and avocation by offering the first-ever animal-focused tour of Israel: Israel Unleashed (www.israelunleashed.yolasite.com). “¢ Neot Kedumim, Israel’s biblical landscape reserve. 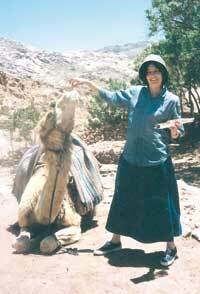 A camel cooperates for the camera, posing with Tova Saul. Participants will meet a Knesset champion of animal-welfare legislation, and Dr. William Clark of the Israel Nature and Parks Authority, whom Saul calls “the king of wildlife conservation.” (Clark spent 30 years engaged in national and international wildlife law-enforcement efforts, including the Interpol Wildlife Crime Group.) At Zichron Ya’akov, the tourists will have dinner at a winery with a spokesperson from Israel’s Let Animals Live organization. “I spent two weeks perfecting the itinerary for a balance between animal projects that are uplifting; evening activities with animal people; and upbeat Jewish experiences like a fun Shabbaton and walking tour in the Old City – along with the standard sites to make it a real Israel trip, such as Tzfat, the Dead Sea, Masada, Caesarea, and the Golan Heights,” says Saul. In the course of exploring the “standard sites,” the group is sure to see a standard sight: stray cats. Saul is an expert in this field, as well, as she just recently released the 165th cat she arranged to have spayed or neutered in Jerusalem’s Old City in the past three years. You can easily identify fixed cats in Israel by looking for one clipped ear. “Tourists should know that’s what a tipped ear means,” says Saul, who financed the first 60 or so cats at her own expense before private donors, Spay Israel, and the city pound stepped in to help. Saul says that non-Jews are welcome to join the tour, “providing they understand there will be Jewish elements that will be fun, such as a Sabbath meal with a family, a Jewish wedding, and a talk with an expert on Jewish dating and marriage.” One of the evening sessions will be a discussion with Rabbi Adam Frank about what Judaism has to say about the treatment of animals (quite a lot, actually). While Saul is in charge of the itinerary and the guiding, Keshet Center for Educational Tourism in Israel has partnered with her to handle the logistics. Tour participants will stay at hotels and kibbutz guest houses during the trip. Saul is not specifying a minimum or maximum age for the trip. “It’s fine for anyone who is physically fit – not Sylvester Stallone, but enough to do some hiking,” she says. Hezekiah’s Tunnel, the Old City ramparts, and Ein Gedi Nature Reserve are among the itinerary items where walking and climbing ability will come in handy, plus there will be rafting on the Jordan River. As a licensed tour guide living in the Old City, Saul has had occasion to guide a wide range of guests, including the actor Kirk Douglas, who endowed several institutions there. She is probably best known in the cobblestone alleys, however, for her animal rescue work. It all began with a crying kitten she came upon not long after her arrival. For more information on Israel Unleashed, contact Saul at (972) 2 6713518 or IsraelUnleashed@gmail.com.